murumuru - The Art of Peter Foti: Keep Calm and Make a Print! Keep Calm and Make a Print! The time has come for a new blogpost, so here I am again. I guess everyone noticed, that I'm on Etsy not with all my works, although you may find plenty of exciting works there. Sometimes it's very hard to decide which print would be popular there, so sometimes I do some research with uploading something new which may be attractive for many people. I'm also a true fan of Etsy since I admire craftmanship a lot believing that the future of commerce is this, in other words: back to basics. 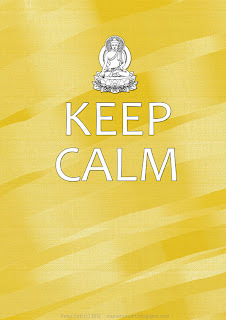 As I'm browsing the prints and graphic design (you can find awesome works out there) I often see "Keep Calm..." posters, which is fun. They are all funny interpretations from the original UK Goverment's "Keep Calm and Carry On" posters appearing on the streets of the United Kingdom during the WWII. From the years of 2000, this poster has become so popular as a wall decoration and since than many-many remakes has been done with funny call to action messages and different objects on top (replacing the original crown) referring to those. Superb design! :))) Love it!